With rain chances in the forecast and puffy white clouds dotting the sky 5 o’clock sky, we took off to Leavenworth. Heading east via Winchester, we came upon a detour sign. Not to be deterred, we made a stop to ask the locals how to get around this bump in the road and were sent along a paved county road that turned out to be amazing riding. If the recent Gypsum Hills ride reminded us of a western movie set, this particular byway was more reminiscent of a highway in the Carolinas. Winding, hilly, tree lined—absolutely exhilarating and quickly added to the list of “must ride again and bring friends”! Leavenworth marked the beginning of the byway. Being the “First City” of Kansas, this city’s history and present merge together beautifully. Home of the original Army outpost in the wild west, Fort Leavenworth, as well as the darkly beautiful US Leavenworth Penitentiary, we found a community that we want to get to know much better. When traveling, we strive to find the best locally owned restaurants to try. Leavenworth presented a multitude of possibilities, including Italian, Vietnamese, Korean, BBQ, and Thai. High Noon Saloon rose quickly to the top of the list with their locally brewed microbrews to sample. Nestled down along the river-front among brick building being renovated into loft-style living, the Saloon served up self-proclaimed “killer beer” in addition to terrific food. Well-fed, we wandered along the North Esplanade, a street overlooking the Missouri River. One side featured historic homes, the other a view of the river and bluffs with a path and park benches set out for travelers and locals alike to enjoy. We’ll definitely be back to explore this history-laden city. Heading north to Atchison along Hwy 7, we encountered several references to the famous folk that had traveled this area before us, namely Dwight D. Eisenhower, Louis and Clark, and Amelia Earhart. The road was wide and smooth, winding through the hills left behind by the glaciers that cut through this area so many years ago. With a gorgeous red sunset to the west and verdant hills lush with green grass and herds of cattle, we puttered along the highway in no hurry to find our next stop. Just 24 miles up the road, Atchison beckoned with plenty of history to explore. Riding into town at dusk, we stopped at the Atchison Historical Society and Santa Fe Railroad Station, situated next to the uniquely named “4th of July 1804 Creek”, a moniker given by William Clark, Meriwether Lewis’ traveling partner. After exploring the train engines, we were chased back home by lightning in the southern skies, with part two to be ridden in a few days. Day two was another beautiful evening ride from Atchison to White Cloud. As we rolled up and down the hills, across river valleys rich with tilled farm ground, it was compelling to consider how Louis and Clark would have encountered this area as they traveled across the nation. The White Cloud area features several historical stops and is located near the Iowa Indian Reservation, the Native American Museum at nearby Sparks and an overlook that allows you to see all four states—Kansas, Iowa, Missouri and Nebraska. 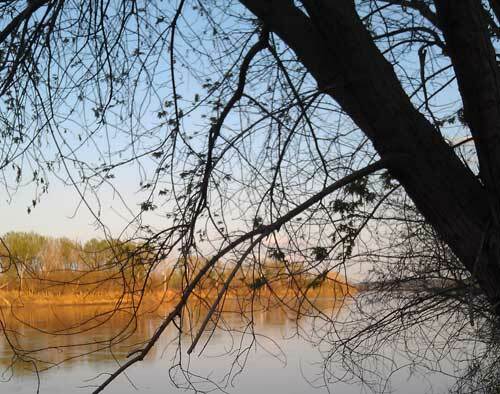 You can stand along the banks of the Missouri River for a peaceful break, or head on up to the state line another four miles up Highway 7. I once thought I was familiar with the highways and back roads in a good deal of Kansas. However, this byways adventure is definitely opening my eyes to new byways, roadside stops and communities to explore. We’ll definitely be doing this Glacial Hills Scenic Byway again soon, with friends in town.